Caesar salad is much maligned in the cafe world, particularly in the 90’s and early 00’s. So often served with slathering of mayonnaise, oversized croutons and horrid violently salty anchovies and lots of random additions. Made right though this salad can be a beautiful balance of textures and flavours that will have you changing your mind about the career salad. First up the quality of your ingredients is essential. I know this is the case with everything we cook and make, but when serving a salad there is nowhere to hide. For me the most important part is making sure your lettuce is crisp and fresh. I love using cos hearts as the leaves are sweeter and crunchier. Make your own croutons. So simple to do. Get a left over bread roll or piece of baguette and thinly slice it. Spread out on a baking tray. Brush with olive oil (Parmesan oil if you have it) and lightly salt. Place in a roughly 180c oven until they are golden and crispy. Allow to cool. For your meat choose bacon or prosciutto. Cook it until browned and crispy. I use my sandwich press as it means all the liquid drains off to ensure the crispy was. Oven roasting is probably the way to go here too but beware the oven mess. 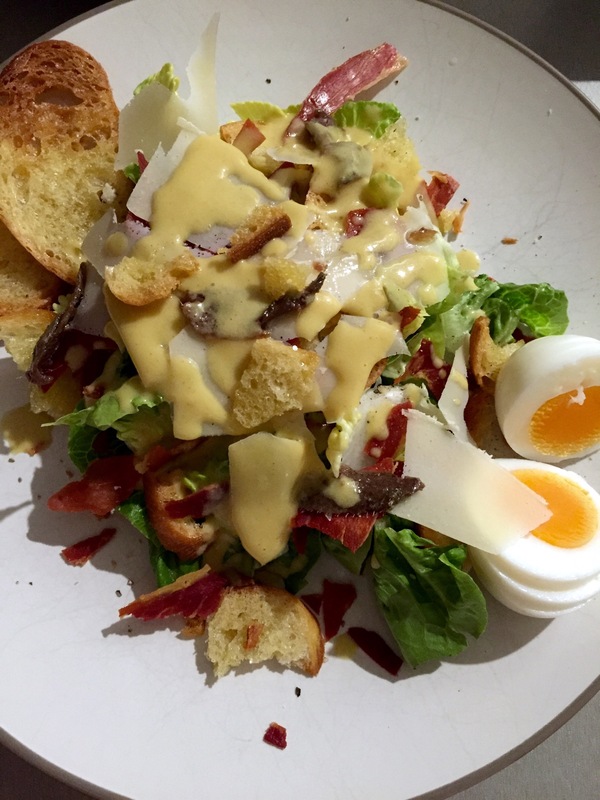 For dressing I tend to forgo the creamy and often overused Caesar dressing. If I do use it then I drizzle sparingly over the ingredients rather than smothering everything in it. I find that this salad is delicious dressed with a light white wine mustard vinaigrette. It highlights the various flavours rather than drowning them out. To serve you can either create this salad as individual portions or go for a large and impressive plate to be shared in the middle of the table. It is merely a matter of layering as you go and serving fresh to eat. I’m probably making this salad at least once every two weeks at the moment as it suits the warmer weather we are experiencing at the moment but is still substantial enough to have us leaving the dinner table feeling satisfied. No two salads are exactly the same but each one has been as delicious as the last by following the basic principles of above. I’ve also taken to ordering it again if we end up at a pub eating. This time around though I’m smart, dressing on the side and even sometimes the croutons and anchovies so I can decide just what I have on my salad. I’m so much happier with what I get on my plate that way. For me though the Caesar salad is enjoying a revival that brings it back to being the beautiful salad that it really is. Prepare all your ingredients as explained above. Layer onto a plate starting with the lettuce and then sprinkling the goodies of the bacon and croutons over the top. Finish up with the cheese, egg and anchovies. Just before serving drizzle with the vinaigrette. To make the dressing place all ingredients into a clean jar and shake to emulsify, alternatively you can do this in a bowl with a whisk. Reblogged this on Caesar's Girl.